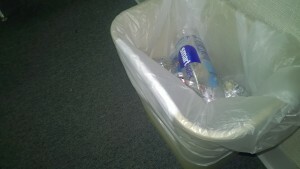 According to a study featured in the Millennial Magazine, 80% of all plastic bottles end up in landfills. This means that if you buy ten plastic bottles a week, chances are you will probably only recycle two. This does not mean that you hate the environment, you simply are not offered the convenience of having a recycle bin next to you right at the precise moment that you need it. Our consumer society advertises many items, but few are actually environmentally friendly products. The status quo of a plastic bottle’s convenience dominates even today, when consumers are aware of the damage that plastic bottles cause when these are tossed into landfills and oceans. Whittier College is taking small steps into removing itself from this social paradigm. Just this year, as freshmen started pouring into campus for Orientation on a hot Southern California day, boxes of boxed water were lined up, ready to instill environmental awareness upon these brand new poets. The boxed waters were a hit and now Bon Appetit is looking into boxed water as a replacement for the plastic bottles that are not as eco-friendly. 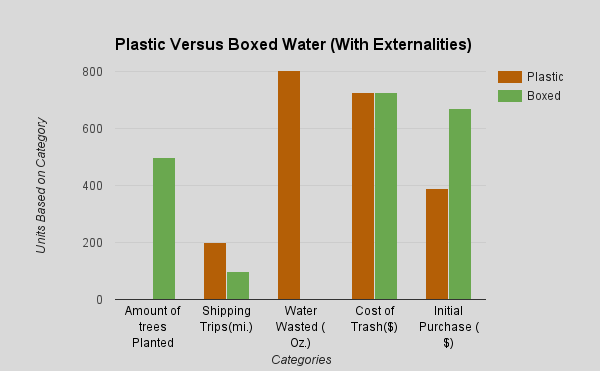 But how exactly can one know that boxed water is not only more green than a plastic bottle, but also economically viable?